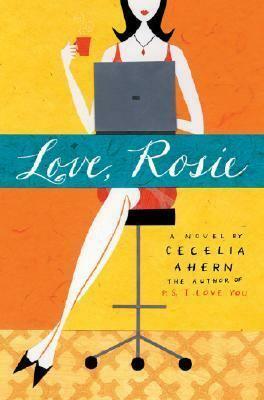 the tenth book is cecelia ahern's love, rosie. i'd said in the previous post that there would be moments you'd want to hurl that book. you'll want to hurl this one, too. with a lot more force and frequency. because alex and rosie ... their story spans more than four decades. they are two of the most infuriating, exasperating, idiotic characters ever conceived. the other thing i like about this book is that the whole thing is written in dialogue, beginning as the notes they write to each other in miss big nose bad breath casey's class and progressing to instant messages and emails, if not to each other then to their friends about one another. makes for a very quick read. yes, i must, and you will read it. okay, if i had invited you to my tenth birthday party then brian the whine wouldn't have been invited. if brian hadn't gone then he wouldn't have thrown pizza all over jamie's sleeping bag, and if he hadn't done that and completely ruined my party then you and i wouldn't have hated him so much. if you and i hadn't hated him so much then you wouldn't have had to drink so much in order to be able to accompany him to the debs. if you hadn't done that ... well ... perhaps you wouldn't have been quite so drunk, and your darling little katie wouldn't have been born. therefore i did you a favor! and that, rosie dunne, is my theory. very clever, alex, very, very clever. but you needn't have gone that far back to accept responsibility for katie. here's my theory. had i not been stood up by you at the debs, i wouldn't have had to go with brian the whine at all. had you showed up at the airport that day our lives could have turned out very differently. yeah, that's something i'm beginning to wonder about.